About dentures - tauranga. Otumoetai Dental Lab. 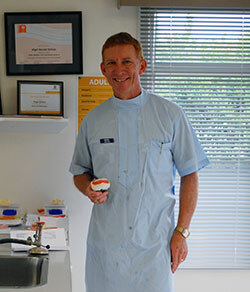 Nigel Shilton is a second generation Tauranga Clinical Dental Technician. Nigel's father, Harold supported the Tauranga community with denture services for many years and Nigel continues to offer outstanding levels of care to his denture clients. With over 30 years of experience, you can rest easy, knowing your denture requirements are being looked after by a true professional. Otumoetai Dental Lab is still a family business with sister Andrea working alongside Nigel. Read testimonials from our denture clients here or call us on 07 5761150 to make an appointment to discuss your denture requirements.